Looking around the world today one cannot fail to notice how unattended conflicts with strong ethnic and religious undercurrents can erupt into devastating violence and bloodshed that make them virtually impossible to solve. A case in point for such conflict represents the long-standing simmering tensions between the minorities and the government of the People’s Republic of China. In Tibet and Xinjiang, home to two major ethnic groups in China, we are witnessing in recent time the return of a climate of intimidation, fear and repression reminiscent of the days of the Cultural Revolution. Intensified repression and persecution by Chinese authorities are resulting in an unprecedented radicalisation of Tibetan and Uighur resistance. Since 2011, 129 Tibetans have set themselves on fire in series of drastic protest against unjust Chinese policies in Tibet. In Xinjiang, in an atmosphere of merciless repression by Chinese authorities, Uighurs are resorting to indiscriminate violence against Chinese government personnel as well as civilians. This is the tragic result of a minority policy of the Chinese communist government that relies primarily on the use of force, intimidation and coercion as principal means to rule. In the case of Tibet the Chinese government continues to view Tibetan Buddhism, Tibetan distinct culture, language and identity as a threat to the stability of the Chinese rule in Tibet. The lack of true autonomous rights and freedoms in Tibetan areas in China, enabling Tibetans to protect and develop their unique and distinct culture, religion, language and identity, poses a serious threat to the very survival of Tibetans as a distinct people. The forced transformation of Tibet in China’s own image is uncovering the existing autonomy in Tibet as empty and meaningless. This is at the heart of the problems that Tibetans are facing today. Today, when we look towards China it is obvious that the cycle of repression by the Chinese government on one hand and resistance by Tibetans and Uighurs on the other is spiralling dangerously out of control. The sad fact is that presently the relationship between Tibetans and Uighurs and the Chinese Central Government is sliding towards a human and political catastrophe. Against this alarming background it is, today, a political imperative for members of the international community to engage in a concerted effort to encourage and urge the Chinese leadership to enter into an earnest dialogue with the representatives of the Tibetan and Uighur people with the aim of finding a peaceful and mutually acceptable solution. 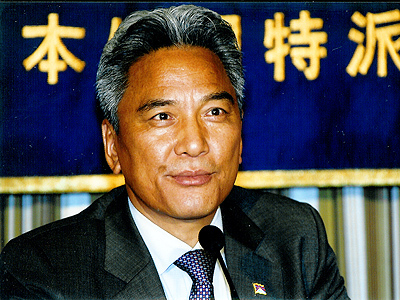 The policy of the Tibetan leadership in exile on a mutually acceptable solution is straightforward. We are not seeking separation and independence. What we are seeking is genuine self-rule for the Tibetan people within the framework of the Constitution of the People’s Republic of China (PRC). Our main concern is to ensure the survival of the Tibetan people with our distinct Buddhist cultural heritage and language and the natural environment of the Tibetan plateau. This approach is called “Umay-Lam” – the Middle Way Approach – and was conceived by His Holiness the Dalai Lama in the spirit of non-violence, dialogue and reconciliation. His Holiness the Dalai Lama started internal discussions, as early as in 1974, to find ways to resolve the issue of Tibet through an autonomy arrangement instead of seeking independence. In 1979 the Chinese leader Deng Xiaoping expressed willingness to discuss and resolve all issues except the independence of Tibet. Since then His Holiness the Dalai Lama has taken numerous initiatives to bring about a mutually acceptable negotiated solution to the question of Tibet. In the spirit of „Umaylam“His Holiness the Dalai Lama presented in 1988 at the European Parliament in Strasbourg a formal proposal for negotiations. The choice of the European Parliament as the venue was on purpose in order to underline the point that a genuine union can only come about voluntarily when there are mutual respect and satisfactory benefits to all the parties concerned. His Holiness the Dalai Lama sees the European Union as a clear and inspiring example of this. The belief in the political necessity of peaceful co-existence of different cultures, religions and ethnic groups without separation and segregation in today’s highly interconnected and interdependent world. This requires the spirit of pluralism and cooperation and of solutions with no victor and no vanquished. In the course of time His Holiness the Dalai Lama and the Tibetan leadership in exile adjusted some components of the Strasbourg proposal in order to conform to existing political realities of China. Moreover, the Tibetan leadership took the courageous decision to seek genuine autonomy for Tibet within the framework of the Constitution of the PRC. His Holiness the Dalai Lama and the Tibetan leadership in exile are confident that the basic needs of the Tibetan nationality can be met through genuine autonomy within the PRC. The PRC is a multi-national state, and as in many other parts of the world, it seeks to resolve the nationality question through autonomy and the self-government of the minority nationalities. The Constitution of the PRC contains fundamental principles on autonomy and self-government whose objectives are compatible with the needs and aspirations of the Tibetans. Regional national autonomy is aimed at opposing both the oppression and the separation of nationalities by rejecting both Han Chauvinism and local nationalism. It is intended to ensure the protection of the culture and the identity of minority nationalities by empowering them to become masters of their own affairs. To a very considerable extent Tibetan needs can be met within the constitutional principles on autonomy. On several points, the Constitution gives significant discretionary powers to state organs in the decision-making and on the operation of the system of autonomy. These discretionary powers can be exercised to facilitate genuine autonomy for Tibetans in ways that would respond to the uniqueness of the Tibetan situation. In implementing these principles, legislation relevant to autonomy may consequently need to be reviewed or amended to respond to the specific characteristics and needs of the Tibetan nationality. Given good will on both sides, outstanding problems can be resolved within the constitutional principles on autonomy. In this way national unity and stability and harmonious relations between the Tibetan and other nationalities in China will be established. In October 2008 the envoys of His Holiness the Dalai Lama presented the Memorandum on Genuine Autonomy for the Tibetan People to the Chinese leadership and in January 2010 an explanatory Note on the memorandum on genuine autonomy. These documents put forth in detail how the basic needs of the Tibetan people for self-government can be met through the application of the principles on autonomy contained in the Constitution of the PRC and the Note clarifies and dispels misunderstandings and concerns that the Chinese side had expressed with regard to the Tibetan memorandum on genuine autonomy. Unfortunately, the Chinese government rejected the Tibetan proposal for genuine autonomy “as demands for semi-independence and disguised independence”.Obviously, the then Chinese leadership lacked the political will to address the issue of Tibet in earnest. As a result of the Chinese intransigence the talks between the envoys of the Dalai Lama and the Chinese government are stalled since January 2010. There is no dispute among independent experts and unbiased politicians and scholars that the Tibetan Memorandum calls for the exercise of genuine autonomy, not for independence, ‘semi-independence’ or ‘independence in disguised form’. The substance of the Memorandum, which explains what is meant by genuine autonomy, makes this unambiguously clear. The form and degree of autonomy proposed in the Memorandum is consistent with the principles on autonomy in the Constitution of the PRC. Autonomous regions in different parts of the world exercise the kind of self-governance that is proposed in the Memorandum, without thereby challenging or threatening the sovereignty and unity of the state of which they are a part. This is true of autonomous regions within unitary states as well as those with federal characteristics. In view of the absence of official contact and dialogue since January 2010, in June this year the democratically elected Tibetan political leader Dr.LobsangSangay launched the international awareness campaign of “Umaylam”. On this occasion Dr.LobsangSangayreaffirmed his Administration’s commitment to abide by the path of non-violence and to strive for genuine autonomy for the Tibetan people. He also reiterated that the representatives of the Dalai Lama stand ready to engage in a dialogue anytime anywhere. In light ofthe alarming developments in Tibet we Tibetans are compelled to appeal to the international community for help. The Tibetan people – an ancient nation with its distinct and rich cultural and spiritual civilization, language and identity – is disappearing fast from the face of the earth as a result of the Chinese government’s policies in Tibet. Members of the international community can play an important role in encouraging, promoting and facilitating a just and peaceful resolution of the conflict in Tibet. Moreover, there is a new leadership in China and this new Chinese leadership is yet to formulate and announce its thinking and policy on Tibet. Consequently, this represents a unique window of opportunity to act on Tibet and to engage the Chinese government on the issue of Tibet. This is a time for concerted international efforts to urge the Chinese leadership to enter into a result-oriented dialogue with the representatives of the Dalai Lama. The European Union can play a leading role in promoting and urging for dialogue and in opening a new page in Tibetan-Chinese relations under the new leadership in China. Such a EU initiative will send a powerful message all over the world that Europe supports and stands in solidarity with people and movements embracing the spirit and culture of non-violence, dialogue and reconciliation. It is this spirit and culture advocated by the Dalai Lama for resolving conflicts in the 21st century. The world needs Europe to play a leading role in the promotion, defence, and protection of human rights. At the core of Europe’s spirit is a fundamental belief in the inherent equality and dignity of all peoples and are the values of human rights, democracy and the rule of law.It is important that this spirit of Europe does not halt at the borders of Europe out of political expediency or because of commercial interests. The oppressed people around the world need Europe’s commitment to these values beyond the shores of Europe.